Give your at-home tipples a cocktail lounge finish with this set of natural, aromatic bitters. Give your at-home tipples a cocktail lounge finish with this set of aromatic bitters by Tobin Ludwig, Eduardo Simeon & Jomaree Pinkard, made from natural ingredients ranging from grapefruit to caramel to ginger. 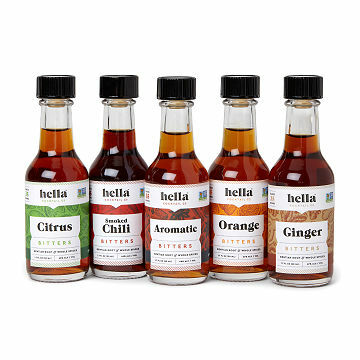 Each of the five small-batch bitters are formulated with a particular spirit in mind, from citrus-kissed vodka to a spicy bourbon, letting even beginner bartenders hone their specialty cocktail. Handmade in Queens, New York. Click here for recipes for your Cocktail Bitters Set. Click here to learn what flavors go best with your Cocktail Bitters Set. Tobin Ludwig, Eduardo Simeon and Jomaree Pinkard create a variety of handcrafted goods that raise the bar on imbibing and culinary experiences. The trio crafts in small batches with the finest ingredients available, the resulting quality is no coincidence. They started testing out batches in Brooklyn a few years back and their passion for quality has been there since the beginning. What started as a weekend project has grown to a full-time production in pursuit of delicious flavors. My dad was very excited to see the bitters because he's been wanting to experiment with cocktails. My husband loves these! They even includes recipes on the bottles! Tasty, and makes a very cute personalized small gift when you customize a cocktail recipe to the recipient using one of bitters. Loved the communication received from this site regarding where the package was in the shipment process. Unfortunately, one of the bottles of bitters broke sometime in the process.